Jesus used stories to say some other things to the people. 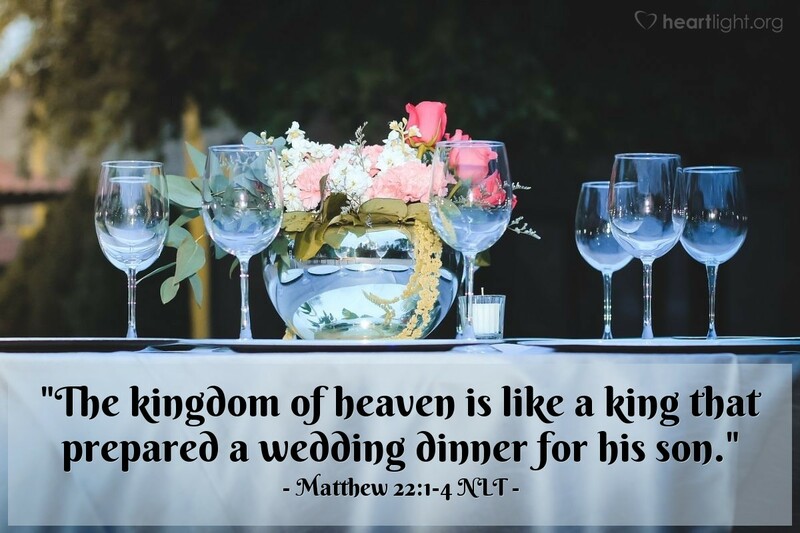 Jesus said, "The kingdom of heaven is like a king that prepared a wedding dinner for his son. The king invited some people to the feast. When the feast was ready, the king sent his servants to tell those people to come. But the people refused to come to the king's feast. Then the king sent some more servants. The king said to the servants, 'I have already invited those people. So tell them that my feast is ready. I have killed my best bulls and calves to be eaten. Everything is ready. Come to the wedding feast.'" I love stories. It doesn't matter if they are parables or just anecdotes. When stories cut across our experience, when they are built out of the fabric of our lives, then they capture us and work themselves down into hearts. Jesus loved stories about weddings. They were such a joyful and passionate time in his culture. For him, a wedding offered all sorts of opportunities for teaching. So many people had seen them and been a part of them in his time. The emotions ran deep. The families and friends involved added color, tension, excitement, love, confusion, joy, and risk. Jesus once again uses a story to make his point. A point we can't miss. But today, remember Jesus used stories. We're so prone to spout a proverbial saying, a slogan we've heard from sports, or even a rule we've picked up from our religious environment. But today, let's be reminded of the power of stories and learn to tell more of them. Especially stories that carry a Kingdom message. Please, dear Father, help to use stories in the life of my family, with my children, and around my friends that help them catch a glimmer of your glory and the power of your dawning Kingdom. In Jesus' name I pray. Amen.